What is muck diving? Muck diving gets it’s name from the fact that dives are in mucky water, often shallow, silty water that many would not consider ideal for diving. Visibility is often poor. Dives are often around piers, junk and dead coral rubble. Dives are often in shallow water close to shore. The reason divers choose to dive in these areas is because of the incredible amount of small, weird and wonderful critters that live in these environments. Critters like pygmy seahorses, ornate ghostpipefish, manderinfish, mimic octopus, blue ringed octopus, frogfish, leaf fish, nudibranchs and so on. These small species are hard to find and require a trained eye but there are few places in South East Asia which are particularly rich in these little gems. 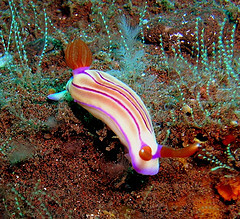 Bali and the Lembeh Strait have some great places to muck dive but many divers are converted to muck diving around Mabul or Kapalai. The majority of divers visit these resorts with only on thing on their mind, big fish. But they soon begin to appreciate the wonders of muck diving when their expert divemasters start pointing out amazing creatures that they’ve never seen before. One of the beauties about Sipadan/Mabul dive vacations is that divers get the best of both worlds. Dive with the sharks and turtles in the morning then in the afternoon dive in the muck of Mabul or Kapalai. Most resorts on the islands allow unlimited shore dives so divers can buddy up and spend hours in the shallows perfecting their macro photography skills. There are several dive sites scattered around Mabul Island, some accessible from shore, others with a short boat ride. Most resorts have their own house reef. Crocodile Avenue is a shallow site with a maximum depth of 20m. Visibility can be as high as 20m in high season but is more likely to be 5-10m especially in the off season. Good buoyancy control is required so as not to kick up any more sediment. Other critters to look out for here are seahorses and their relatives the pipefish. Ornate ghost pipefish can be found drifting in the current just off the sea bed. Bent sick pipefish cunningly disguise themselves as, yes you guessed it, bent sticks. They may not be the most exciting fish in the world but there is a certain thrill in finding something so well hidden. Also in the sand are garden eels. 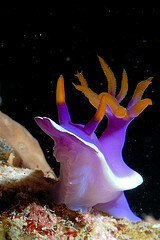 Various nudibranch species, many of them with no common name, just latin ones, live on patches on coral. Frogfish and leaf fish can be seen here as can scorpionfish and lionfish. There are thousands of shrimps and gobies in the sand, often working together in a symbiotic relationship. Night dives are also popular on this dive site when all the same critters are still in evidence and it may also be possible to see cuttlefish, often in pairs. Even eagle rays have been spotted here. 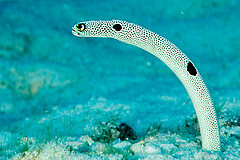 The dive site is named after the garden eels that cover patches of the sandy bottom here. Normally they stand erect with much of their body out of their hole swaying in the current. However when a diver approaches they quickly retreat into their holes. Beautiful blue ribbon eels can also be seen poking out of rubble holes as can peacock smasher mantis shrimps. The smasher nickname comes from the incredible power of their hammer like claws that can smash through crustacean shells and would break a divers bones if they got in the way. 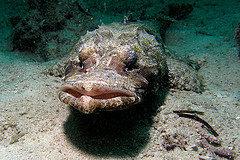 Moray eels can be seen on the coral reef as can frogfish and leaf fish. Twin spot lionfish and scorpionfish are also present. Shrimps and gobies are numerous as are various species of nudibranch. Pipefish and seahorse are other possible sightings for the more observant diver. It doesn’t sound great so far does it? 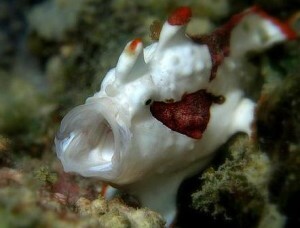 However, give diving here a try and you’ll see frogfish everywhere. These cryptic fish, so hard to spot in other locations, are prolific on this dive site. They still camouflage themselves into the coral and sponges, waiting to pounce on unsuspecting prey but they are easier to spot because of their numbers. Frog fish are also bigger at Froggy Lair, many as big as soccer balls. You can see frog fish of various colours including blue, white, yellow and orange. If they move at all it’s just to waddle slowly, making them easy photo subjects. Photographers can spend hours on this dive site just shooting frame after frame of frogfish. Lucky photographers may get a much sought after open mouth shot. Other critters to look out for are ornate ghost pipefish, leaf fish, crocodile fish, stone fish, scorpionfish, lionfish, cowries, and numerous nudibranch species. Cuttlefish can be seen including the beautiful flamboyant cuttlefish. If you are especially keen to see a particular critter, tell your divemaster and they’ll do their best to find it. They dive these sites every day and their eyes are well tuned to finding everything. They know where stuff is usually seen, what habitat it prefers and what it eats. If you stay on the platform you can descent the oil rig elevator to sea level and dive below the rig as often as your computer will allow. If you stay on Mabul or Kapalai the platform is just a minutes boat ride away. Conditions are calm with minimal current, visibility is average and the maximum depth is 17-20m. This is an easy dive for all levels of diver. So what can you see here? Schools of fish fill the gaps between the pylons, much like on a wreck or cave entrance. Frogfish and leaf fish are common in the debris as are various and colourful nudibranchs and sea slugs. Ornate ghost pipefish are numerous too. Lionfish hunt in the shadows. Scorpionfish are well camouflaged. Giant moray eels are one of the bigger species seen here. 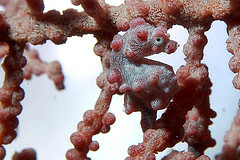 Seahorse are also spotted, including the elusive pygmy seahorse. No bigger than a finger nail, you’ll need a good macro lens if you want to get a good photo.